When you have been running with a racket behind a shuttle day in day out and for more than 15 years, you know the ins and outs of the badminton world better than anyone. Although I think you should never forget where your roots are, it’s sometimes nice to peek into somebody else’s backyard. And that’s exactly what I am doing since last week! Fortunately, this backyard is also focussed on a sport because sport is in every bone of my body and really belongs to my DNA! With my top-level sport background and my sports marketing education at the Johan Cruyff University this ” transfer ” may not be entirely unexpected, but it definitely is not ordinary! 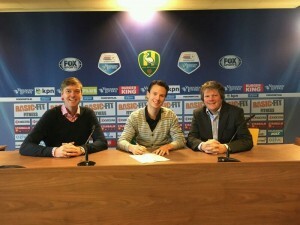 I am pleased, proud and highly motivated to have started my new job at the Dutch Premier League Football club ADO The Hague. And I haven’t been contracted as a second goalie, but as an account manager at the commercial department. I am taking up this challenge with a lot of fighting spirit and passion! Moreover, this does not mean that I will get out of the badminton world. Of course I still play with a lot of pleasure for 1.BV Mülheim in the German Premier League and I will continue, whenever possible, to coach and train badminton teams and to give clinics, demonstrations and continuing training. All this because I still love the badminton game and I want to pass on all the knowledge and experience I have gained over the years. This message has been posted on maandag 7 december 2015 at 07:31.